Sorry to have been so MIA. i so don't do famous is taking up A LOT of my time. Just ask my family! And then there are the usual suspects like water polo practice, swim team practice, piano lessons, SAT classes. Child #4 is giving a speech on Harriet Tubman. Child #2 is in finals week. Child #1 is over mono (yay!) and starting a new job. So....last weekend I went on a writers' retreat with the San Diego SCBWI (Society of Children's Book Writers and Illustrators). My critique partners also came along. The retreat was at the San Luis Rey Mission in Oceanside, CA. The mission was built circa 1798. This is a typical room. Fairly sparse. Which was fine because I was there to write. Poor internet connection. Which was better than fine because I wasn't tempted to skip around in cyberspace, thus wasting precious writing time. Denny's Chick Critique Partner Kathy Krevat hard at work in the room. Denny's Chick Critique Partner Kelly Hayes hanging out in the hall. A view of the grounds. The setting was beautiful and peaceful. I loved the sound of the clock bells. I will tell you something I learned about monks. They are not good cooks. No doubt they excel at praying. And this group seems pretty talented at gardening as well. But they definitely do not take cooking seriously. Kelly, Kathy and I snuck out for a delicious Thai dinner on Saturday evening. I know our secret is safe with you. All in all, I had a very productive weekend. 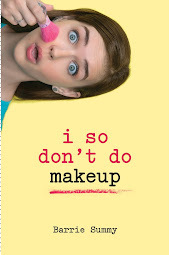 And I came home to a google alert about Green Girl in Wisconsin's contest for a signed copy of i so don't do spooky. Thank you, Green Girl! You are very generous. And your blog is uberentertaining! A loving and caring aunt gave her niece a copy of I SO DON'T DO SPOOKY for Christmas. Thank you SO much for I So Don't Do Spooky. I am enjoying it SO much. I try not to read it too fast so that I don't get to the end too quickly. The happy niece. And look how neat and tidy her room is! 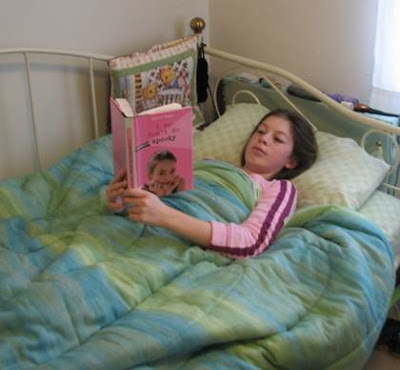 "I try not to read it too fast so that I don't get to the end too quickly." This is the kind of sentence that stops an author's heart. Thank you for the forward, Aunt M.
I will be basically incommunicado this weekend. Yes, dear children, this counts for you too. I'm going to a writers' retreat through my local SCBWI. We're spending the weekend at the San Luis Rey Mission in Oceanside, CA. I will be writing up a storm. And eating meals prepared by monks. Yes, you read that right. I hope we're not talking unleavened bread and water. I'll post about the experience on Monday. Why do I love my Denny's Chicks? Do I love them because they're great writers and plotters and friends? Yes. Do I love them because they're great at critiquing and finding all the holes and monstrosities in my work? Yes. And gently, or not!, pointing out said holes and monstrosities? Yes. And, of course, I love Kelly for her fantastic handmade birthday cards and the delicious little nibblies she bakes for our holiday get-together? And, of course, I love Kathy for always hosting said holiday get-together? Oh, how I love my Marmite! And here is a delightful Marmite website. Enjoy! I was back up in Hollywood, CA yesterday. Doing research. I'm furiously writing i so don't do famous, Book#4 in the mystery series. 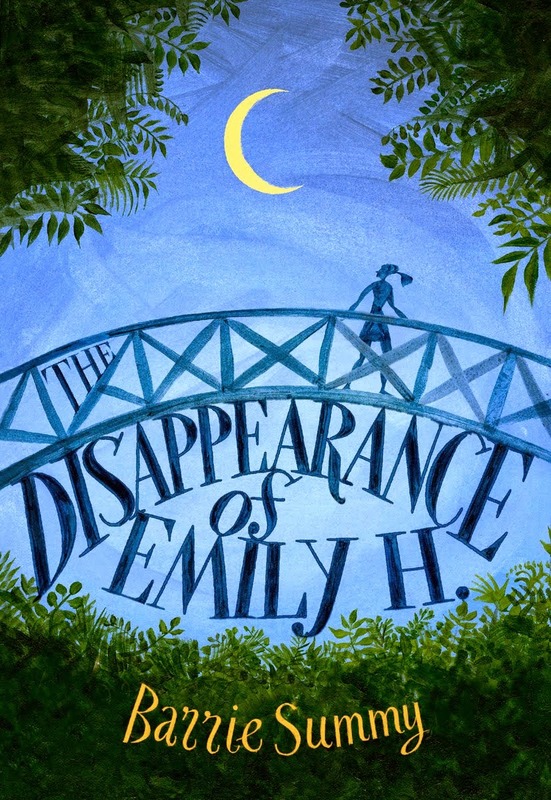 Suddenly I discover there are a few places 13-year-old detective Sherry Holmes Baldwin is determined to visit. Places I've never been to. And a couple more more places she plans to hang out at that I, uh, barely remember. So, off a-researching I go. With Sherry's love of junk food, you know she'll be eating at the one-and-only Pink's Hot Dog Stand. Plus, it's located fairly close to the hotel she's staying at with her dad and her best friend, Junie. Pink's is family owned and has been around since 1939. At first, it was a large-wheeled pushcart. By the way, it took a while to get this shot because there's so much traffic on La Brea. But, for your viewing pleasure, I waited patiently. Everybody eats at Pink's. Including a lot of famous people. You might see a limo pull up while you're in line! Here's a close-up of a fellow countryman. Some famous people have hot dogs named after them. For example, the $5.70 Martha Stewart dog is 16" long with relish, chopped tomatoes, onions, sauerkraut, bacon and sour cream. And a little trivia about prices: During the depression, Pink's chili dogs sold for 10 cents. Here's part of the menu. Thank you to the young man who let me snap a shot of his order! Sorry, but it was too early in the day for me to successfully face a hot dog. And a special thank you to Kathy Krevat, fellow Denny's Chick critique partner, who researched with me. And made it such a fun day! Now, hop on over to the My Town Monday blog to see what others are posting about. Guess what Child #4 brought home in her backpack? Sherry's in Scholastic! I SO DON'T DO MYSTERIES is an Editor's Choice! Yes, yes! The Summy Family is so excited that they're dancing around in their pajamas! 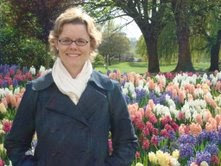 MEET EILEEN COOK! Eileen and I have lots in common. We're agent sisters because we have the same agent. We're mirror opposites: She's an American living in Canada. I'm a Canadian living in the USA. We both have brown hair. In the final weeks of eighth grade, Lauren Wood made a choice. She betrayed her best friend, Helen, in a manner so publicly humiliating that Helen had to move to a new town just to save face. Ditching Helen was worth it, though, because Lauren started high school as one of the It Girls–and now, at the start of her senior year, she’s the cheerleading captain, the quarterback’s girlfriend, and the undisputed queen bee. 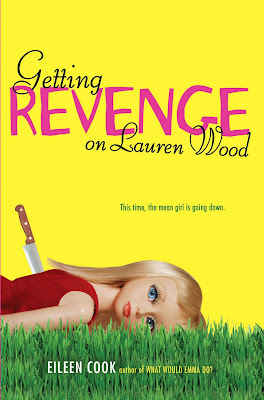 Lauren has everything she’s ever wanted, and she has forgotten all about her ex-best friend. But Helen could never forget Lauren. After three years of obsessing, she’s moving back to her old town. She has a new name and a new look, but she hasn’t dropped her old grudges. She has a detailed plan to bring down her former BFF by taking away everything that’s ever been important to Lauren—starting with her boyfriend. Watch out, Lauren Wood. Things are about to get bitchy. And now for my hard-hitting interview! Me: First off, I love the cover. Love it. Did you have any input? Is that your kitchen knife? Eileen: I love this cover too! I may have actually squealed when I opened the jpeg the publisher sent. I There is a scene in the book where the main character dresses up a Barbie doll in a cheerleader outfit and then chucks it into a wood chipper. I thought it would be fun to show someone holding a Barbie doll by it’s hair and sticking a pin into it- voodoo style. I shared my idea, but the art department warned me that Barbie is trademarked so they frown on people sticking pins in her on book covers. (I thought this was a bit unfair as I've bought more than my fair share of Barbies over the years) The designer did like the concept so she ordered a custom made doll from China and created the cover we ended up with. Eileen: I had the same best friend all through middle school and high school. We're still very close friends even though we live on different sides of the country. I keep threatening that if she ever shares my deep dark teen secrets I will tell her daughter what she was really like. I still have the diaries and some of our passed notes to prove it. As a teen I had the super power of invisibility. 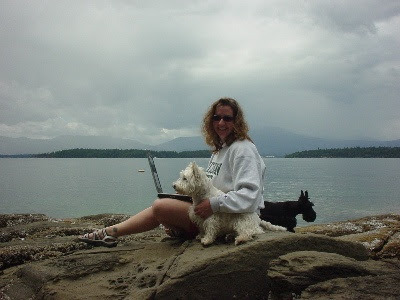 I wasn't popular or unpopular- I had the ability to blend into the background. I can only wonder what I could have accomplished if I hadn't been so worried about what everyone thought of me all the time. Me: Do you laugh out loud when writing? I ask this because I laugh out loud when reading your books. I'd like to think we're laughing together. Eileen: I crack myself up when I'm writing. Sometimes I even get the full on snorting, tears in the eyes laughing. I'm so glad to know you're laughing with me as well. I would hate to think I was laughing all by myself, that would just be sad. Me: What's up next for you writing-wise? Eileen: I am sooo excited to be working on a new YA book. It is about a prank that goes wrong and the main character has to decide how to deal with the fall out. I'm also working on a middle grade series about a girl who is a part of a fairy godmother family. I'm one of those people who are happiest when I've got a project on the go. Me: The next is sort of a delicate subject. But my readers expect me to ask the tough, hard-hitting questions, so here goes. Rumor has it that you wear your pj's out in public? Is it true? Be honest. We have cameras everywhere. Eileen: What kind of person goes out in public in their pj's? Eileen: FINE! Yes, I have been known to go out in my pj's, but that is because of your bad influence which encouraged me to believe this was okay. 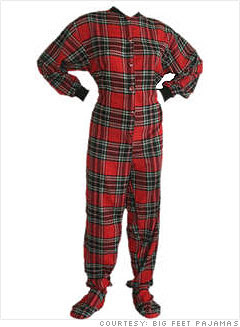 Plus, I will have it known that I have very stylish jammies. Me: Ha! But I do! The head and the hands have been removed for legal purposes. But, friends, this is Eileen Cook! Here's Eileen modeling Victoria's Secret or maybe it's a link to her very hilarious blog! Here's Eileen's husband modeling Victoria's Secret or maybe it's a link to the first chapter of GETTING REVENGE ON LAUREN WOOD. Well, friends, I hope you enjoyed reading this interview as much as I enjoyed writing it! Thanks for being such a good sport, Eileen! If you live in San Diego or have visited here or have watched the news recently, one thing you'll have figured out about us: we love our zoo! 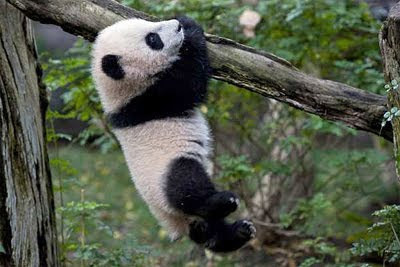 And, right now, we'll all about giant pandas! Your average man on the San Diego street could fill your ear with panda facts, particularly Yun Zi panda facts. -When Yun Zi was born this past August, he was the size of a stick of butter and hairless and blind (just like a stick of butter!). This is all normal, by the way. 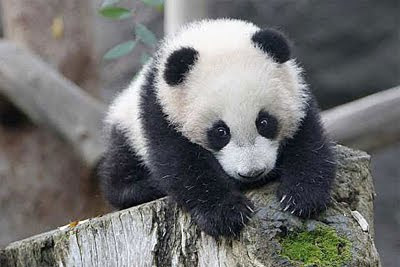 -Pandas spend about 12 hours a day, eating 84 pounds of bamboo. They have to eat so much bamboo because it's super low in nutrients. (This is a little like me grazing on my favorite food--licorice!) We grow bamboo on and off the zoo grounds, just to feed our pandas' habit. Yun Zi's four siblings were born here (3 sisters and a brother). Yun Zi has been the shyest and, as a result, didn't go on display until he was 5 months old (last Thursday). He'll be on display 9am-noon daily, unless there's inclement weather (yeah, right, like we experience that!) or he's moody or ill. He currently weighs about 19 pounds (our chubbiest so far at this age). He lives in the enclosure with his mother, father and two sisters (his other two siblings were returned to China). Oh, you want to join in our pandamania? Here's the link to the pandacam! Now, hop on over to the My Town Monday blog to see what the others are posting about. Yes, this is our adorable Yun Zi again! HAPPY NEW YEAR! Welcome to the first meeting of The Book Review Club of 2010! Our resolution this year? To absolutely 100% TOPPLE your to-be-read pile. So grab a mug of java and a handful of cookies. Or water and carrot sticks, if you've made THOSE kinds of resolutions! Pull up a chair and join us as we usher in the new year with a bunch of book reviews. You remember KELLY HAYES, one of my Denny's Chicks critique partners? OUT OF THE GOODNESS OF HER HEART, Kelly is reviewing a book for us this month. Why? Because she loves me. And she knows I'm on deadline for Sherry's fourth mystery adventure. Kelly INSISTED on getting me off the hook by taking over this month. INSISTED. 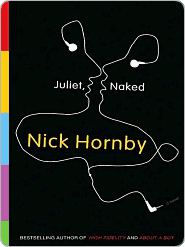 Nick Hornby’s latest, Juliet Naked is a novel about deep-seated obsession of the worst kind: the music fan. And in Hornby’s deft hands, it’s hilarious. Duncan is a rabid English fan of Tucker Crowe, a reclusive American singer-songwriter who is barely living off his brief career in the mid-80s. Duncan, a “Crowologist”, considers himself the foremost authority on all things Tucker Crowe. So when Crowe releases the demo version of his only hit album, Juliet, Duncan is the first to give it a glowing online review. Annie, Duncan’s live-in girlfriend of fifteen years, disagrees with his effusive assessment of the album and publishes her own, more realistic review, which captures the attention of Tucker Crowe himself. Thus begins an online relationship that quickly elevates to a face-to-face one for Annie and Tucker. Of course, all of this causes Annie to reevaluate the last fifteen years of her life, spent with a man obsessed with someone he’s never met. “It had always been hopeless. It was an unsuitable internet date with an inadequate, unexciting man that had lasted for years and years and years. “Annie realizes the only way forward is to kick Duncan out. This is where it becomes more Annie’s book than anyone else’s. Annie is a woman approaching middle age who never had children because Duncan, caught up in his narrow self-absorbed world, never wanted any. Now she’s wondering how to live her life for herself and on her own terms. Deep down she’s a nurturer who feels this part of her has been wasted on clueless Duncan. In Tucker, she finds a man more worthy of her generous nature. It’s also Tucker’s book. I found it fascinating to get a glimpse into the inner workings of a one-time rock hero whose continuing fame (obscure though it may be) is due solely to the internet and the sense of community it offers to obsessed fans. Tucker is a reluctant hero: sober, clean-cut, bookish. In short, nothing like the image his fans have created. The scene where Duncan finally meets his hero and refuses to believe it’s him, is a comic moment not to be missed. Tucker and Annie’s budding relationship feels real because the characters are fully-fleshed people who we can root for. Neither of them are larger-than-life hero types. They’re just ordinary people doing real things, making bad choices and some good ones too. Even Duncan evokes our sympathy because he’s what we could turn into if we’re not careful. One of Nick Hornby’s biggest talents is in creating characters that live and breathe because they’re flawed. He sees the humor and depth in people who haven’t figured things out yet. And he makes us all feel it. We can inhabit his characters because they’re a lot like us, no matter what country they live in or what music they listen to. Thank you, Kelly. That was wonderful. You should review every month! ;) And now...onto amazing reviews by amazing reviewers! Reviewers: You know the scoop. If I've left you off the list, just leave a comment or email me, and I'll rectify the situation asap. These are some of the PEZ dispensers we have in our house. One of the kids collected them for a while. PEZ candies were first marketed in flat tins as compressed peppermints around 1927 in Vienna, Austria. PEZ comes from the German word for peppermint: PfeffErminZ. Love that word trivia! About 3 billion little brick PEZ candies are eaten in the U.S. each year. The first PEZ dispensers were called "regulars". They were shaped like a cigarette lighter and dispensed breath mints for adult smokers. In 1952, the PEZ Candy Co. stuck heads on the dispensers and fruity candy in them and began marketing to children. Santa Claus and Mickey Mouse were a couple of the earlier heads. By now, you're probably scratching your head and wondering why there's a post on PEZ with the heading My Town Monday. Because.....we have a PEZ museum and store in California! Yes! The Burlingame Museum of PEZ Memorabilia is located about ten minutes south of the San Francisco International Airport. The museum/store is open Tuesday through Saturday, 10 am - 6 pm. Here's the address and phone number: 214 California Drive, Burlingame, CA, 94010, (650) 347-2301. The museum/store began life in 1995 as a computer store. Owners Nancy and Gary Doss also collected PEZ dispensers which they displayed around the computers. Dispensers like the Pineapple PEZ worth $3500 and the Make-A-Face Potato Head Pez worth $5000. Within a year, the computer store morphed into a PEZ museum/store. Per the Silicon Valley Mercury News.com, the Pez Candy Co. from Linz, Austria is suing the Burlingame Museum for the money earned during their fourteen years in business. They are also demanding the melting down of the Doss' giant 7 ft, 10 in snowman PEZ. You can stand next to the world's largest PEZ dispenser (as determined by the World Guinness Book of Records) and feed it $14.95. In return it will spit out a regulation-sized snowman PEZ dispenser. Or you can purchase such items as the 1970's fireman PEZ dispenser for around $75. 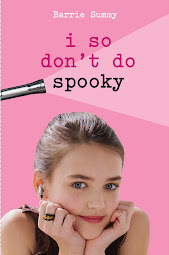 You can visit Blogger Bookworm Readers for a chance to win a copy of i so don't do spooky or an ARC of said book. Or you can click over to The American Cheerleader magazine who are giving away five copies of i so don't do spooky at their online site. So, go win some books and don't forget to pop over to the My Town Monday blog to see what wild and crazy things others in the group are posting about. Have a great First Monday in 2010!! These are the butter tarts Child #4 and I baked for last night's New Year's Eve party. They were delicious and the perfect amount of runny. Happy New Year to you and yours from our little household in Southern California! May your 2010 be happy, healthy and prosperous! And may all your dreams come true!